This verification example is based on Verification Example 0122. 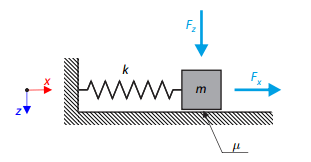 A single-mass system without damping is subjected to an axial loading force. An ideal elastic-plastic material with characteristics is assumed. 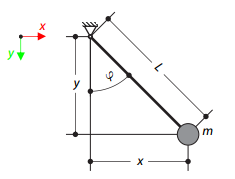 Determine the time course of the end-point deflection, velocity and acceleration. A single mass system with dashpot is subjected to the constant loading force. Determine the deflection and the velocity of the dashpot endpoint in given test time. A thin string is tensioned by the initial strain and initially deflected. Determine the deflection of the test point at given test times. 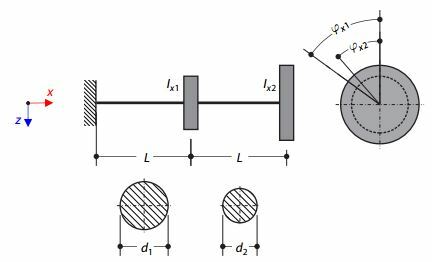 A double-mass oscillator consists of two linear springs and masses, which are concentrated at the nodes. The self-weight of the springs is neglected. Determine the natural frequencies of the system. A double‑mass system consists of two shafts and two masses represented by the corresponding moments of inertia, concentrated in given distance as nodal masses. The left shaft is fixed, and the right mass is free. Neglecting the self‑weight of the shafts, determine the torsional natural frequencies of the system. 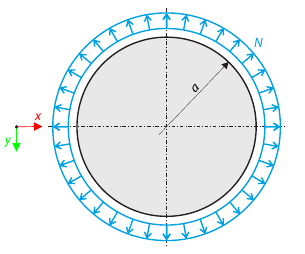 A circular membrane is tensioned by a line force. Determine the natural frequencies of the circular membrane.